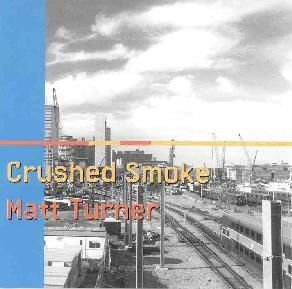 Matt Turner - "Crushed Smoke"
Matt Turner is an improvisational cello player based in Wisconsin. The style is free improvisation in which sounds are typically more important than notes. On some tracks Turner focuses on string manipulation, wrenching sounds from the cello that alternate between percussive attacks and sounds that wail, screech, and drone. The quality of the recording is critical to benefitting from this kind of music and indeed Turner sounds like he's the lone player on a concert hall stage. Each scratch on the string comes across as a full statement, allowing the attentive listener to tune in with precision to all the subtleties of his performance. Among the standout tracks is "Fractals", which features string drones that are simultaneously ambient and grating. These provide the backdrop for a noisy flute-like melody that dances over the drones. Realizing that all this sound creation is coming from a cello is the main fun of the listening experience and Turner manages to keep things interesting and varied throughout. "Blisters" is another highlight that sounds like a full chamber noise ensemble. Equal parts percussion, scratching, and plucking work together to create a multi-player feel and the pace and intensity level is among the highest of the entire set. There's also two tracks which feature Turner playing the Yamaha electric cello. The aptly titled "Tap" is like an avant jazz tribal war dance of sorts that actually lays done a bit of a groove. One of my favorite tracks on the disc. Overall, lots of great ideas and fans of free improvisation will find lots to enjoy, hearing more with subsequent listens. Turner's bio points out that he is also a pianist an in addition to solo improvisation performs jazz standards and alternative rock. He is currently a lecturer in jazz studies at the Lawrence University Conservatory of Music. For more information you can visit the Tautology web site at: http://members.aol.com/Tautology3/. Contact via snail mail c/o Matt Turner; 834 E. Minor St; Appleton, WI 54911.